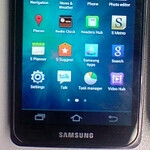 Remember that mysterious Samsung GT-i9300 smartphone, photos of which were sent to us not long ago? Rumor has it that the said model number has been reserved for the highly anticipated Samsung Galaxy S III, but the device in the images looked nothing like a flagship smartphone. And that is because it likely is not, as the rumor mill now suggests. It is speculated that the Samsung GT-i9300 will actually launch as the Samsung Galaxy M (Not to be confused with the Samsung Galaxy M Pro). And considering the company's current smartphone naming scheme, we might be actually dealing with a mid-range device here, not a flagship smartphone. Furthermore, the same sources claim that the Samsung Galaxy M is scheduled for a mid-May launch. But as the case is with any rumor, especially the ones with no evidence to back them up, we would recommend taking all this with a dose of disbelief. On the other hand, if the rumor is on the right track, an official announcement of the said Galaxy M smartphone, or whatever the GT-i9300 ends up being called, might come sooner than later. Sammy will release the galaxy s3 this year no matter what as they don't want apple stealing all the lime light with iPhone 5. @Wendy where the hell did you read that there will be no S3 this year? on topic, how many Samsung mid-rangers do we have? this is getting ridiculous, I seriously doubt Samsung will support all of those devices. WHO CARES ABOUT GALAXY M...WE WANT THE NEWS ON GS III! A TRUE PIC...SOMETHING! No one will waste their time with such an inferior device.